So, I have a Face Book “friend”-he’s not a friend. Years ago I knew him in his official capacity as a senior official in the Kumasi Department of Urban Roads. Now, according to his facebook profile, I believe he is an even more senior official in Urban Roads in Accra. Anyways, back in 2005, after a succession of accidents on the road in front of FOUR VILLAGES INN, I wrote a letter to his department here in Kumasi suggesting that a series of speed bumps, a.k.a. silent policemen, be made on the road to slow down traffic. In the spirit of corporate responsibility, FOUR VILLAGES INN offered to pay for the materials. Now I have to write this…TYPICALLY I received no reply to my letter! So, at the time, I went to Urban Roads myself and met my face book friend….but nothing happened -not even an explanation. Like everything, you lose your energy and move on to other things. At the time though I did come up with the theory why there was no action. 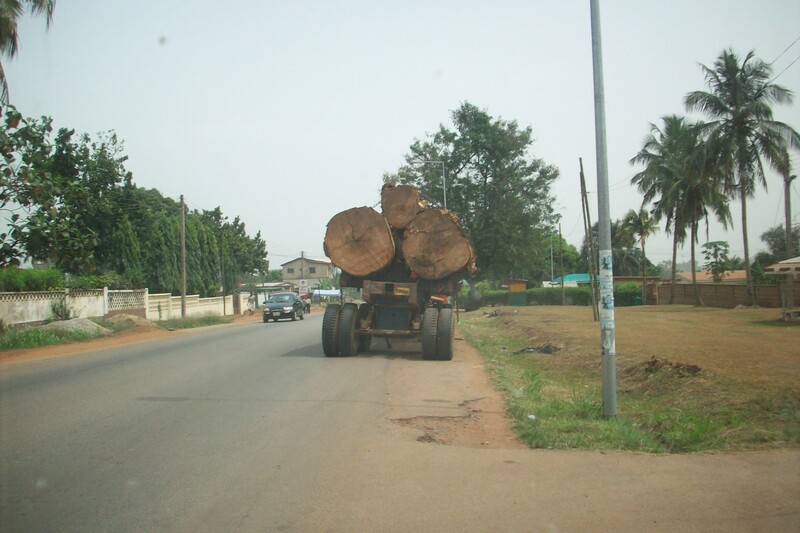 I thought that it was because in the future the big timber lorries would be using the road to go to the new wood village at Sokoban. And sure enough today, the timber lorries with there massive cargoes take this route to the new wood villages. Well, now, a large school is being built right on the Old Bekwai Road a little bit down the road from FOUR VILLAGES INN. Originally the land was zoned as a REST STOP that is toilets given the fact that north of the plot on the left is marginal unzoned land where the Awashie River passes. At the back of the plot where the school is being built, high tension wires cut across the property. And on the right (south) there are warehouses. Incidentally, there is only one small entrance big enough for one car to pass into the small compound with limited parking space. Furthermore there is only a small area on the roadside for cars to stop outside the front wall to drop off students.All the more reason for speed bumps. What a lovely, environmentally safe setting for a school! Indeed, it is not surprising that this plot has been rezoned as a school. Indeed, FOUR VILLAGES INN is happy because now maybe speed bumps can now be constructed on this busy road where cars pick up speed coming into this river valley from Ahodwo in the north and Daban in the south.